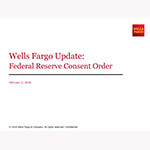 SAN FRANCISCO--(BUSINESS WIRE)--Wells Fargo & Company (NYSE: WFC) announced it is confident it will satisfy the requirements of the consent order it agreed to today with the Board of Governors of the Federal Reserve System. Under the consent order, the company will provide plans to the Federal Reserve within 60 days that detail what already has been done, and is planned, to further enhance the board’s governance oversight, and the company’s compliance and operational risk management. The order also provides for third-party reviews of such plans and, until they are approved and implemented, limits on the growth of the company’s total consolidated assets to the level as of December 31, 2017. The company’s board will submit a plan to further enhance the board’s effectiveness in carrying out its oversight and governance of the company. The company will submit a plan to further improve the company’s firm-wide compliance and operational risk management program. After Federal Reserve approval, the company will engage independent third parties to conduct a review to be completed no later than September 30, 2018 to confirm adoption and implementation of the plans. The asset limitation will remain in effect until third-party reviews have been completed to the satisfaction of the Federal Reserve. After removal of the limits on asset growth, a second third-party review will be conducted to assess the efficacy and sustainability of the risk management improvements. “While there is still more work to do, we have made significant improvements over the past year to our governance and risk management that address concerns highlighted in this consent order,” Sloan said. Separating the roles of chairman and CEO and amending the company’s by-laws to require an independent chair. Electing six new independent directors in 2017 as five directors retired, bringing to eight the total number of directors elected since 2015, and planned refreshment of an additional four directors in 2018, with the retirement of three of those directors occurring by the time of our 2018 Annual Meeting of Shareholders. Enhancing the overall capabilities and experience represented on the board, including financial services, risk management, cyber, technology, regulatory, human capital management, finance, accounting, and consumer and social responsibility. Reviewing the board’s committee structure and leadership, amending committee charters to enhance risk oversight, and refreshing the chairs of certain key committees, including the Risk Committee and Governance and Nominating Committee. Conducting a board self-evaluation in 2017 facilitated by Mary Jo White, a senior partner at Debevoise & Plimpton LLP and former chair of the Securities and Exchange Commission. The self-evaluation informed the board’s changes in its structure, composition and governance practices. Centralizing critical control functions (including Human Resources, Finance, and Technology) to improve enterprise visibility, consistency and control. Centralizing all risk management functions to accelerate the design and implementation of a fully integrated operating model for risk management. Developing and executing comprehensive plans that addressed our compliance and operational risk management programs, organizations, processes, technology and controls. Hiring external talent for critical risk management leadership roles – chief operational risk officer, chief compliance officer and head of regulatory relations (newly created). Forming new centralized enterprise functions dedicated to key risk control areas, including the Conduct Management Office (January 2017), Enterprise Data Management function (September 2017) and Comprehensive Customer Remediation Group (November 2017). The company will host a live conference call on February 2, 2018, at 4:30 p.m. PT (7:30 p.m. ET) to discuss the consent order. The live audio webcast will be available at the following address: https://engage.vevent.com/rt/wells_fargo_ao~9499813. You also may participate by dialing 855-604-1135 (U.S. and Canada) or 574-990-3591 (International). Please find below a link to an investor deck for the call. A replay of the conference call will be available beginning at 7:30 p.m. PT (10:30 p.m. ET) on Friday, February 2, 2018, through Friday, February 16. Please dial 800-585-8367 (U.S. and Canada) or 404-537-3406 (International) and enter Conference ID #9499813. The replay will also be available online at https://www.wellsfargo.com/about/investor-relations/events/ and https://engage.vevent.com/rt/wells_fargo_ao~9499813. Wells Fargo & Company (NYSE: WFC) is a diversified, community-based financial services company with $2 trillion in assets. Wells Fargo’s vision is to satisfy our customers’ financial needs and help them succeed financially. Founded in 1852 and headquartered in San Francisco, Wells Fargo provides banking, investments, mortgage, and consumer and commercial finance through more than 8,300 locations, 13,000 ATMs, the internet (wellsfargo.com) and mobile banking, and has offices in 42 countries and territories to support customers who conduct business in the global economy. With approximately 263,000 team members, Wells Fargo serves one in three households in the United States. Wells Fargo & Company was ranked No. 25 on Fortune’s 2017 rankings of America’s largest corporations. This news release contains forward-looking statements about our future financial performance and business. Because forward-looking statements are based on our current expectations and assumptions regarding the future, they are subject to inherent risks and uncertainties. Do not unduly rely on forward-looking statements as actual results could differ materially from expectations. Forward-looking statements speak only as of the date made, and we do not undertake to update them to reflect changes or events that occur after that date. For information about factors that could cause actual results to differ materially from our expectations, refer to our reports filed with the Securities and Exchange Commission, including the “Forward-Looking Statements” discussion in Wells Fargo’s most recent Quarterly Report on Form 10-Q as well as to Wells Fargo’s other reports filed with the Securities and Exchange Commission, including the discussion under “Risk Factors” in our Annual Report on Form 10-K for the year ended December 31, 2016, available on its website at www.sec.gov.